Signals are a way of sending simple messages to a process or a group of processes and important thing to remember is signal is Not an Exception but Signals could trigger because of an exception. Signals are one of the oldest inter-process communication methods used. They are used to signal asynchronous events to one or more processes. A signal could be generated by a keyboard interrupt or an error condition such as the process attempting to access a non-existent location in its virtual memory. Signals are also used by the shells to signal job control commands to their child processes. Signals are used by the kernel to notify processes of system events. However, signals can only be processed when the process is in user mode (process context). If a signal has been sent to a process that is in kernel mode (kernel context), it is dealt with immediately on returning to user mode. · Exit: forces the process to exit. · Core: forces the process to exit and create a core file. · Stop: stops the process. · Ignore: ignores the signal; no action taken. A signal's handler is set to the default action, then the kernel will handle it, alternatively, a process may have specified its own signal handler. Signal handler is a routine that is called whenever the signal is generated and the sigaction structure holds the routine's address. It is the kernel's job to call the process' signal handling routine. SIGKILL and SIGSTOP are the only signals whose functionality cannot be changed. 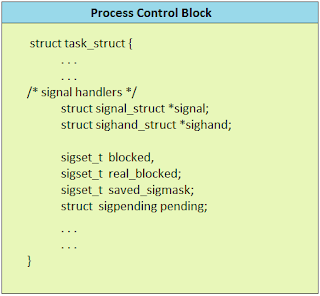 Linux implements signals using information stored in the task_struct for the process. The number of supported signals is limited to the word size of the processor. Processes with a word size of 32 bits can have 32 signals whereas 64 bit processors may have up to 64 signals. The currently pending signals are kept in the signal field with a mask of blocked signals held in blocked. With the exception of SIGSTOP and SIGKILL, all signals can be blocked. If a blocked signal is generated, it remains pending until it is unblocked. Linux also holds information about how each process handles every possible signal and this is held in an array of sigaction data structures pointed at by the task_struct for each process. Amongst other things it contains either the address of a routine that will handle the signal or a flag which tells Linux that the process either wishes to ignore this signal or let the kernel handle the signal for it. The process modifies the default signal handling by making system calls and these calls alter the sigaction for the appropriate signal as well as the blocked mask. The kernel keeps track of pending signals in each process' process structure. This is a 32-bit value in which each bit represents a single signal. Because it is only one bit per signal, there can only be one signal pending of each type. If there are different kinds of signals pending, the kernel has no way of determining which came in when. It will therefore process the signals starting at the lowest numbered signal and moving up.Signals can be blocked i.e., prevented from being received. Here I'am explaining a simple code that would make you understand these concepts, and the flow goes starting with signal registration. This is the oldest one. It accepts two arguments, first signal number (one of those SIGsomething) and second pointer to a signal handler function. Signal handler function returns void and accepts single integer argument that represents a signal number that has been sent. This way you can use the same signal handler function for several different signals. Here is a short code snippet demonstrating how to use it. This is a simple and small application registers its own SIGINT signal. Compile this program and see what is happening when you run it and press CTRL-C.
arg1 : specifies a signal number. arg2,3 : pointers to structure called sigaction. This structure specifies how process should handle given signal. Here is a short code snippet demonstrating how to use sigaction(). thank u very much for the post..
Hi. Thank you for the article. You've mentiod: "Signal may be ignored. Ignoring signal sometimes referred to as blocking signal"
nal is always delivered, and there is no further action.